For me, Merry Berry TE is the most interesting Essence's TE in the whole year. 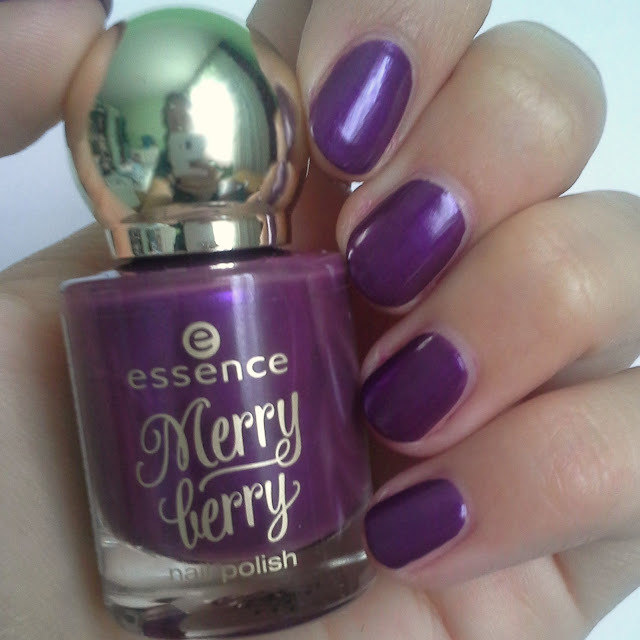 Essence choose Christmasy colors and the packaging is simply adorable. I got just three nail polishes, although I wanted to buy some lipsticks too, but I rarely use lipsticks, so that would be a practically waste of money. I bought three nail polishes: 03 pink & perfect, 02 purple with purpose and a top coat in 01 I love my golden pumps. First something about nail polishes. The brush is straight cut and wide, I wasn't having any trouble applying the polish. The formula is creamy and well pigmented. All the polishes dry very quickly. And, of course, the bottle, like I said it's adorable with that little round cap on it, it looks very festive. 03 Pink and Perfect it's a nice burgundy color, but on me it looks more pink. It's opaque in only one coat, but I used two. This one is my favorite, it's such a pretty color. 02 Purple with Purpose its light purple color. It has a little bit of a pink shine to it. I thought this one was the prettiest but when I applied it on my nails, I didn't like it so much. I used two coats. This top coat was the first that I bought, it was the only one left in Müller and I was very happy that I got it. It's a gold top coat and you can easily apply glitter with one or two coats, you don't need to actually pick up the glitter and apply it. Some other Slovenian bloggers also wrote a review of this collection; Mateja wrote about lipsticks and nail polishes; Petra reviewed a highlighter, a gold powder and nail polishes; Tatjana reviewed almost the whole collection. Did you buy anything from this TE? Which nail polish is your favorite?